Ahh, another Monday! But this is an exciting week for us, because all three showrooms are hosting Cooper-sponsored lighting design seminars this week. Designers and architects can earn ASID/IFDA CEU or AIA Learning Unit credits. I think we may still have a slot or two open, so let me know if you'd like to join us in any of our locations (cschla@dominionelectric.com or 703-814-7460). Until then, my warehouse staff is busy hanging as many new products as possible so we are full of ideas on Wednesday for our seminar. Today I thought I'd show you some of the wall sconces and bath lights we've been hanging. 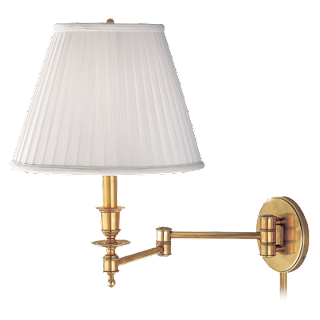 We display this Hudson Valley swing-arm lamp in their Polished Nickel finish. Very handsome styling on this piece. Hubbarton Forge's designs are so streamlined and gorgeous! 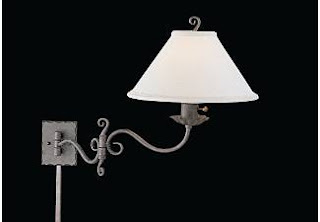 This swing-arm lamp is made by Murray Feiss and the finish is a painted Antique Pewter. 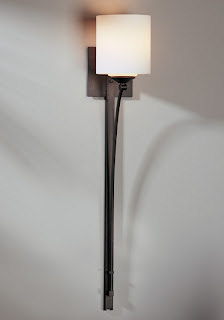 And I love the simplicity of this bath bracket by World Imports. Our buyers return from Dallas this afternoon. I can't wait to hear about all their new finds!